All this driving from city to city on our vacation has been tedious, but it has allowed us to glimpse the countryside, the industry, and the agriculture of Uzbekistan. The largest export in Uzbekistan is cotton. Presently about three-million tons of cotton are produced. When Uzbekistan was a soviet republic, they produced about six-million tons each year to the detriment of the Aral Sea. The country is moving away from this single crop economy, and just last year the president of Uzbekistan ordered that the amount of land devoted to fruit orchards should be doubled. This switch comes at a good time. Because of sanctions imposed by Europe and the US, Russia now imports a great deal of fruits from Uzbekistan. 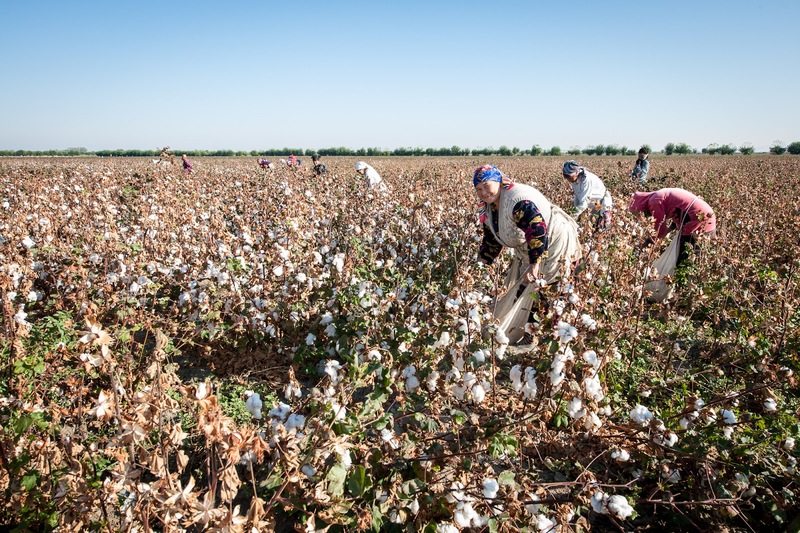 Mid August to early November, about one million citizens of Uzbekistan are mobilized as forced labor for the Cotton Campaign. An Uzbek man told us that when he was about 10 years old he participated in his first cotton campaign. This meant that for about two months every year, he and many other school age children were sent away from their families to live in bare-bones dormitories while they picked cotton during the daylight hours. He said that at first it was an adventure being away from parents and living with school friends, but the tedium of working in the fields soon became the primary memory. These child pickers were paid pennies per kilo of cotton. The forced labor continues today, but as recently as last year the minimum age is 18. This means that university students lose weeks of schooling to the yearly cotton campaign. And, because children under 18 are no longer part of this forced-labor force, their parents must be. Even doctors and other hospital workers are forced to work in cotton fields. Government workers are also forced into labor as cotton pickers. Entire government offices are closed while the employees become pickers with their supervisors watching their progress in the field. In Tashkent we tried to visit a museum, but the guard told us it was closed because the museum's employees were in the cotton fields. Private industry is told by the government how many people must be sent to the cotton fields. If the company is wealthy enough, it is possible to hire a "substitute" picker to stand in for the employee. After 10 days in the fields, the picker gets one day off. Picking cotton by hand is said to preserve the cotton fibers. The longer the fiber, the better the cotton and price. Anyone who has ever shopped for textiles knows that longer cotton fibers means softer, silkier fabric. The weather was beginning to change while we were in Uzbekistan, and we had a few days of rain. Moisture also damages the cotton fibers. After one rain, the government sent out an order to quickly get the crops in and the fields were full of pickers being watched by their supervisors and government officials. 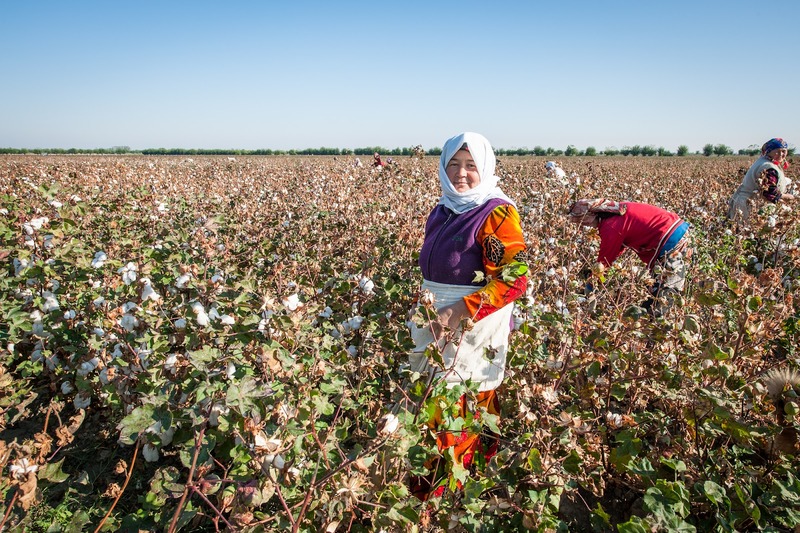 According to a New York Times article, "136 companies, including Disney, Fruit of the Loom, Gap, H & M, Levi’s and Walmart, have pledged to avoid knowingly buying Uzbek cotton" while the practice of forced labor continues. The key word here is "knowingly" as it is difficult to discover the provenance of cotton.